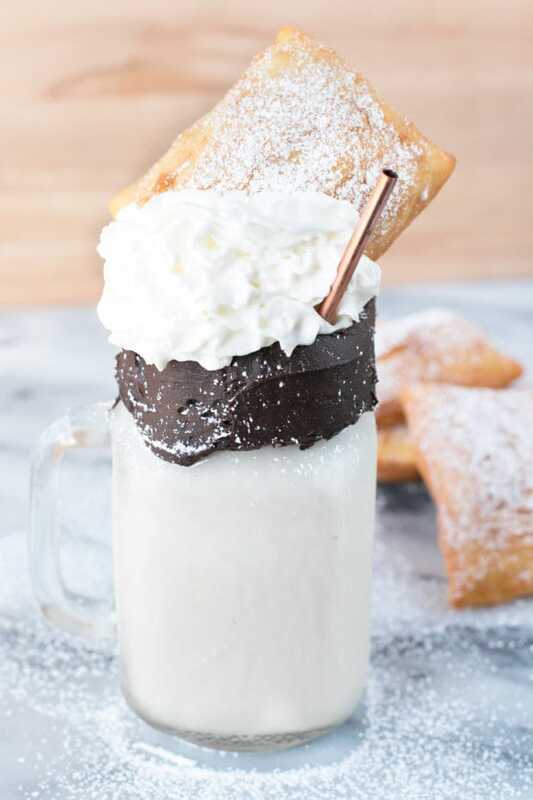 Beignet and Coffee Cocktail Shake is a boozy, coffee-spiked glass of rich beignet that’s 100% drinkable, to the point of being dangerous. 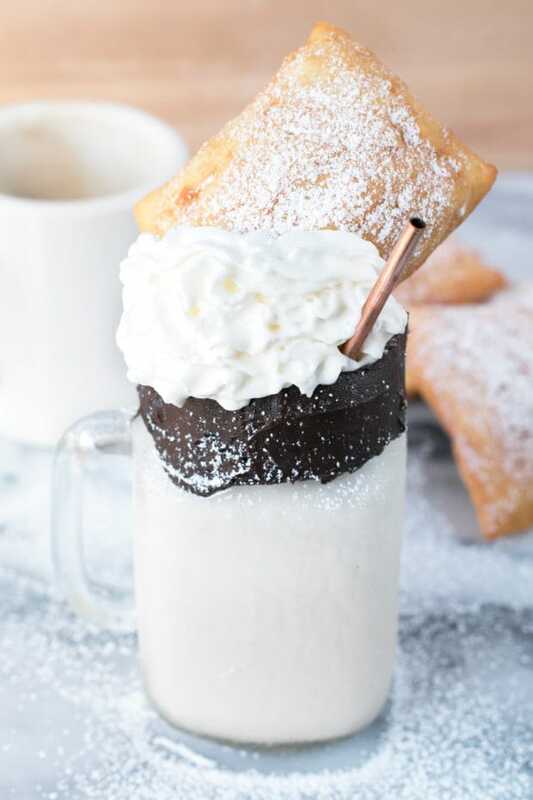 The mashup of beignet and coffee in this shake is a creamy, dreamy mixture that will have you throwing Mardi Gras beads in no time. Let’s celebrate Fat Tuesday right, shall we? 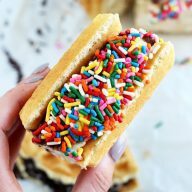 Don’t hate me for putting something so rich and delicious in front of your face on a Friday morning. I’m really not trying to torture you. It’s all in preparation for the weekend! Just take a moment to take in all of this beignet and coffee deliciousness that’s sitting in front of you. Take it in. Let your mouth water. Embrace the stomach grumbles that you are feeling right now, wishing you were sipping on this cocktail. Yep, you definitely need to make a stop by the store on the way home tonight. 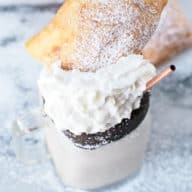 This beignet and coffee cocktail shake is something everyone needs to experience, whether you celebrate Mardi Gras or not! I love fresh beignets. They are light and airy and topped with a heaping helping of powdered sugar, making them the perfect breakfast treat to pair with your morning coffee. So why not throw it all in a milkshake and make it a little boozy? This is how you start your weekend off on the right foot (or, erm, sip I suppose?)! I couldn’t stop the Mardi Gras fun at just ONE cocktail, so I’m here to share a couple of my fav gal pals’ recipes just in time for your Fat Tuesday celebrations. 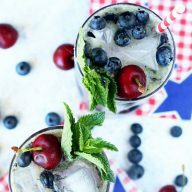 Check out their links and cocktails below! Cheers to Mardi Gras! 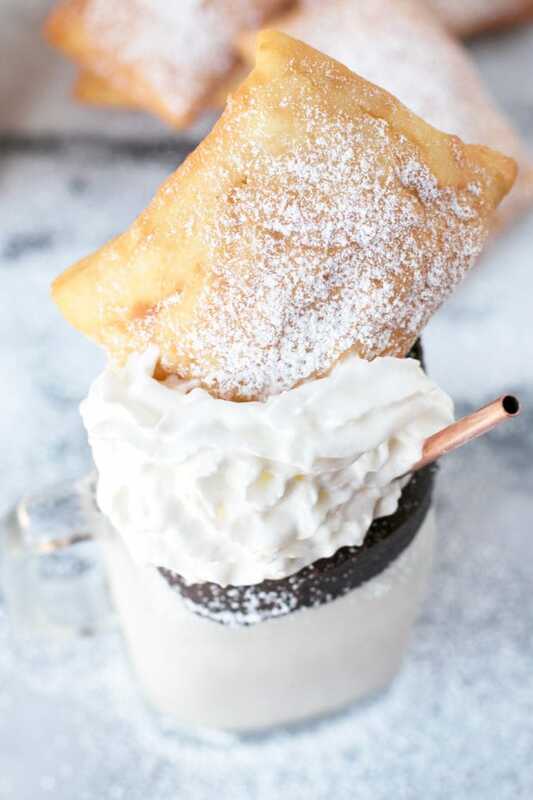 A powdered sugar beignet, coffee and some booze, all in a creamy dreamy shake! Add cake-flavored vodka, vanilla ice cream and espresso liqueur to the bowl of a blender. Blend together until smooth. Add more ice cream as desired to reach ideal consistency. 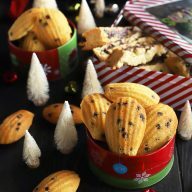 Rim a tall glass with dark chocolate frosting and sprinkle with confectioners’ sugar. Pour cocktail shake into the glass. Top with whipped cream, cinnamon sugar and a beignet. 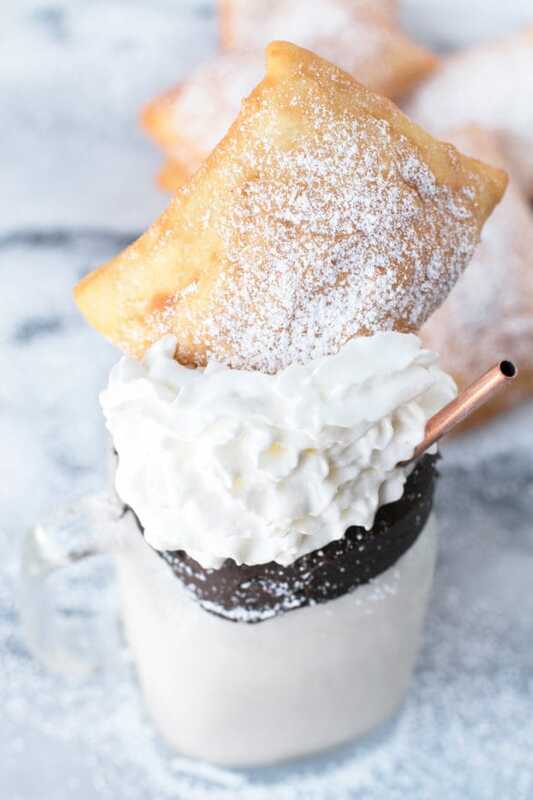 Pin this Beignet and Coffee Cocktail Shake recipe for later! Umm, yeah. 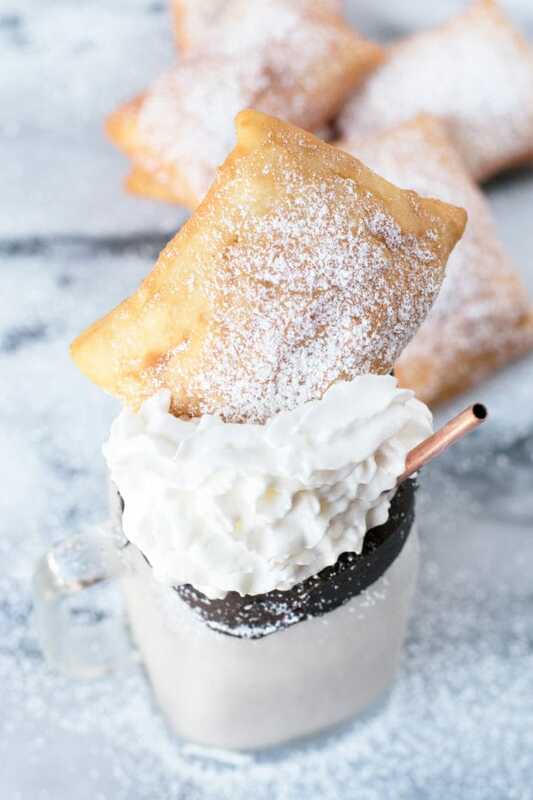 I’m going to need one of these beauties STAT because you just combined so many of my favorite things, and since it’s Mardi Gras weekend, calories don’t count, and I NEED A BEIGNET ON MY BOOZY SHAKE. OF COURSE.